BY JIM MERRITT; Jim Merritt is a frequent contributor to Newsday. Bob Blair is used to seeing dramatic scenery from the split windshield of his 1948 Willies- Overland pickup, but the view on the beach is especially bracing on this warm October morning. "Wow, those are big waves," Blair marvels as he drives his Willies (actually a Willies cab welded onto the chassis of a rusted 1977 International Scout) off the paved back road at Smith Point County Park near Mastic Beach onto the outer beach. Blair, 52, of Sayville, is not here solely for the driving, scenery and salt air, though. The treasurer and membership chairman of the 60-member Long Island Off Road Club is leading an all-volunteer beach cleanup. At 10 a.m., more than a dozen members of the organization, most driving Jeep Wranglers, Cherokees and CJ-7s, had congregated in the park's lot. After letting some air out of their tires to improve traction in this kind of terrain, they rumbled past the park checkpoint bound for the outer beach. "Did everybody get through the checkpoint?" Blair asks into his CB radio as he waits for the rest of the convoy, which includes Blair's wife, Joan, a teacher at a Brentwood elementary school, driving a Ford F-250 pickup. With all accounted for, the day's activity can begin: clearing charred driftwood, plastic bags, a broken fishing rod and other detritus from the strand in one of the monthly events sponsored by an organization that regularly goes where other drivers fear to tread. Conservation-minded public service is part of the popular sport of off-road driving, experts say, and so is family fun, camaraderie and the chance to traverse some of the Northeast's most rugged, unspoiled scenery. 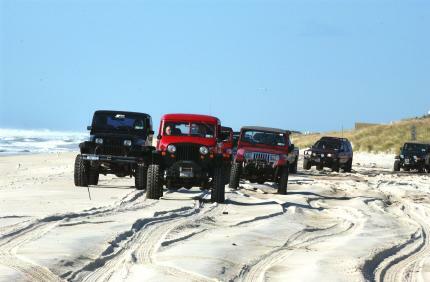 In addition to their beach treks, local off-roaders visit parks in Pennsylvania, lesser-known private and public lands and places in the Berkshires of Massachusetts and in Connecticut. "We do some heavy-duty rock crawling," Blair says. What's the appeal of driving - literally - on rocks? "It clears your head; it's a bond with nature and the woods," says Thomas Riker, 46, of Miller Place, the secretary of the Long Island Off Road Vehicle Association. Its 1,000 members include some 4x4 off- roaders, but the group is principally for all-terrain vehicles and off- road motorcycle fans. Off-roading also offers "quality family time together," says Riker, who used to hit the trails in a Chevy Silverado 4x4 with 36-inch off-road tires. He still occasionally takes the four- wheel drive to the beach or snowboarding sites with his wife, Denise, and son Jesse. But nowadays Riker mostly rides a KTM 250 EXC, an off-road motorcycle. Something of an off-road activist, he will be meeting next month with a Suffolk Legislature task force to discuss the creation of an off-road, all-terrain-vehicle (ATV) park in the county. This is a sport anyone can try - with the right equipment, training and permits. Bob Blair's wife, Joan, who has had hip replacement surgery, said off-roading offers opportunities for people with impairments who want to enjoy the wilderness but would otherwise be prevented from going deep into terra incognita. "Handicapped people can see the kinds of things they'd never see," she said as her Ford bounced along between the dunes on Smith Point's Burma Road. "Suffolk County parks allow outer beach access to anyone with the proper permit," says parks spokeswoman Emily Logrande. The prerequisites: a permit fee and equipment such as a jack and a jackboard to support the jack, a chain or snapline and a portable air compressor or air tank to return the tires to full pressure (there are air stations at the exit, though). "The big attraction of joining a club is the camaraderie and the help - this isn't something you can do successfully alone," Bob Blair says. 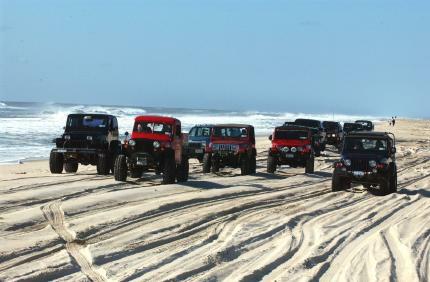 The Long Island Off Road Club is part of the East Coast 4 Wheel Drive Association, which covers clubs from Michigan to Maine and south to Maryland and West Virginia. The club membership includes several police officers, a computer systems administrator, a real estate salesman and at least one driver with a newly minted license. "I like going four-wheeling; it's my only hobby," says Amanda Fliedner, 18, of Sayville, an office worker for a construction company who got her license a year ago and used it almost immediately for off-roading. Once a month Fliedner goes on club trail runs with her boyfriend, Scott Pausewang, 21, also of Sayville. In his "trail truck," a 1972 Bronco, they've traversed Paragon Park in Pennsylvania and her family's private property in upstate New York. She's been clearing trails on the family property and hopes to eventually invite other club members up for the day. Fliedner is saving money to put in a 6-inch lift to raise the chassis in her 1998 Jeep Cherokee to make it trailworthy. With a new set of 33-inch tires, the conversion will cost about $5,000, she estimates. Off-roading isn't cheap. In addition to a sport utility vehicle or other four-wheel-drive vehicle, you'll need special equipment. The more rugged terrain, with bigger rocks and extreme tilt angles, requires lockers that make both tires on the same axle receive full power, and winches for getting past obstacles that don't offer the traction to climb, Blair says. Dan Koopman, 30, of Bethpage, a computer engineer in Port Washington, has equipped his black 1990 Jeep Wrangler YJ with an on-board air compressor, a CB and a roll cage for protection while driving through tight spots. Those are key safety precautions in a sport where rollovers happen. Before getting married last year (Koopman and his wife, Stacey, make runs together now), Koopman owned a 1979 Chevy Blazer with a little, er, history. When he was 19, the Blazer rolled 1 1/2 times trying to climb a dirt hill on private property on Long Island. The Blazer landed on its roof. Rollovers are "when you do it wrong," explained Ken Bart, 27, a Wantagh architect and another member of the Long Island Off Road Club. Bart's off- roading motto is "keep the shiny side up and the greasy side down." Despite the rollover potential, injuries are exceedingly rare, thanks to the slow speed and the safety equipment, club members say. "We do safety inspections every time we go out four- wheeling to make sure we have seat belts, batteries are tied down and the truck doesn't leak any fluids so we don't damage the environment when we go out," Koopman says. Another concern in populated areas of such states as Connecticut and Massachusetts: attracting the enmity of property owners who object to the stream of vehicles riding past their land. In past years, regional off- roaders utilized mainly public lands, but lately they have been turning to privately owned off-road parks in Pennsylvania. The parks cater to drivers of all ability levels, much like a ski resort, Bob Blair says. "On park trails, the equivalent of bunny trails are rated for stock vehicles which haven't been altered with special equipment," he says. If you decide to off-road, you'll need very good driving skills to match the demolition- derby vehicle safety options. Clubs offer tips from veteran off-roaders and advice about avoiding the more common mistakes, such as going too fast or being too aggressive, Blair says. "You can't act like you're in a television commercial. This is a skill, and it takes patience."